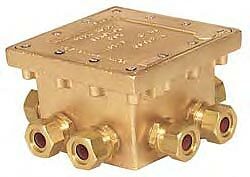 The PEM J35 JUNCTION BOX is custom made of cast bronze, is stainless steel fitted and comes with a Neoprene cover gasket. It is equipped with a grout frame for flush installation into concrete. The PEM J35 Submersible Pull or Junction Box is designed for flush installation into concrete pool floors, walls or decks. 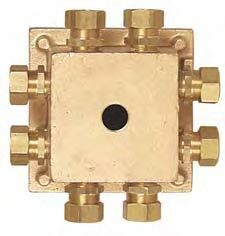 The design of the junction box permits a great variety of custom made inlet and outlet combinations. All threaded connections must have a suitable watertight thread sealant. All connected supply conduits must be self draining in visible locations. All tappings must be specified. 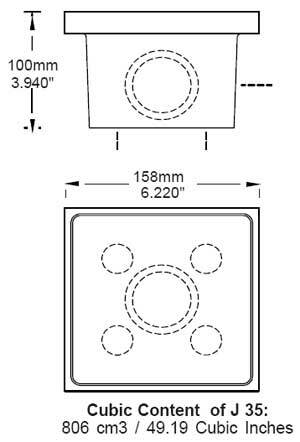 When box is ordered without tapping specifications a blank box without tappings will be supplied (PEM #375-5000).